As we know, R2-D2 can do many things in Star Wars such as repairing spacecraft, hacking computer, etc. But in time of peace it seems more useful as a robot vacuum cleaner. 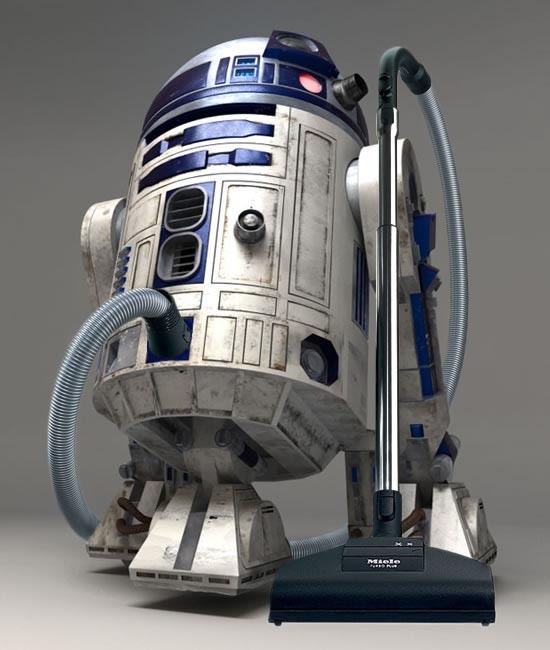 Just as we see, the unique R2-D2 has been equipped with a stretch hose and cleaning path. Apparently there is a reserved space for collecting trash in the cylindrical body. Anyway, whether it’s lucky or not for R2-D2, this is just a concept art called R2VAC2, created by Agent-Spiff. Then one question, do you want a R2-D2 vacuum cleaner? Maybe one day, a real full-function R2-D2 would appear in our life instead of a replica or artwork. By the way, if you like the uncommon R2-D2, you might like to check the Heineken version R2-D2 or Iron Man style R2-D2.